The Muntinlupa Scholarship Program said there’s no truth to the video making the rounds in the Internet and assured local scholars of the City Government’s impartiality in the implementation of its programs and delivery of public service. 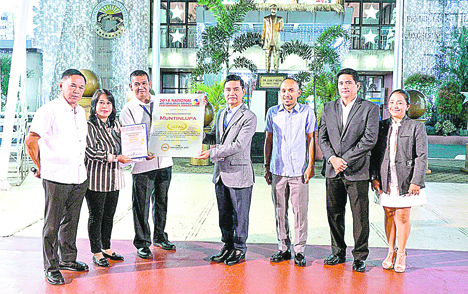 Department of the Interior and Local Government-Muntinlupa director Bing Ferino (second from left) confers an ‘deal’ status marker to Mayor Jaime Fresnedi (center) for the local government’s outstanding initiatives in building drug-free communities on Monday. Muntinlupa earned the high standing for garnering 90 points in DILG’s Anti-Drug Abuse Council on 2017. The city government was lauded for its exemplary efforts in complementing the national government’s anti-illegal drug campaign. Also in photo are Drug Abuse Prevention and Control chief Florecito Ragudo and City Councilors Alan Camilon, Louie Arciaga, and Ivee Tadefa. MSP released its official statement on its Facebook page following the posting of a video in social media claiming the removal of local government scholars in the grounds of political preference. MSP warned the scholars to be vigilant and wary against fake news with the intent to mislead the public. Muntinlupa City holds the most number of scholarship program beneficiaries in the country with over 60,000 scholars. The local government offers a comprehensive educational assistance program for students in elementary to college, including technical-vocational, graduate school, and for students taking up law and medicine. Established in 1990, the scholarship program in Muntinlupa City initially catered to college students in local universities including the Pamantasan ng Lungsod ng Muntinlupa, then called Muntinlupa Polytechnic College. On 2013, under the leadership of Mayor Jaime Fresnedi, the local government expanded to an inclusive scholarship bracketing as educational assistance was made available for elementary and high school students. Mayor Jamie Fresnedi stressed his commitment to uphold fairness and objectivity in governance during his message in the local government’s flag raising rites last Jan. 7. “The local government will remain to place public service above politics. We are committed to be unbiased in the delivery of service for all Muntinlupeños, no one left behind,” Fresnedi said. The local exec urged local officials to observe solidarity despite approaching the mid-year elections as to not hamper or delay services for the constituents.